This divergence appears to open up after the crisis, with the two countries’ corporate debt stocks having following a broadly similar path before (chart 1). So what lies behind this? The fall in UK corporate net debt relative to the US does not appear to be caused by a rise in deposits. As this post describes, there has been a long term trend for companies in the UK to hold more cash, a trend that has continued in the UK since the financial crisis. This is amplified by an increased desire to self-insure against financial risks following the financial crisis. But deposit growth in the US has been similar to that in the UK recently. Thus differences in deposit growth cannot account for the sharp fall in UK corporate net debt relative to the US: it is driven by lower gross debt in the UK. Differences between the UK’s and the US’s business cycles cannot account for the difference in corporate net debt. If corporates’ leverage is to some degree pro-cyclical, then, if the US recovery is a little more advanced than the UK’s, higher leverage in the US could at least partly be explained. But this doesn’t seem to be able to fully account for the difference in companies’ leverage on either side of the Atlantic. UK business investment has picked up only slightly less than it has in the US. We can do a counterfactual simulation where UK investment growth is assumed to have been the same as in the US following the crisis. This extra investment is then assumed to be financed by debt or by running down deposits and thereby reducing savings. Under this scenario UK corporate net debt would only be about 1pp of nominal GDP higher – small relative to a difference of around 15pp with the US. The difference in net debt does not appear to be due to differences in the cost of borrowing in the two countries either. Spreads on bank lending and corporate bonds appear to be similar in the US and UK, indicating similar funding costs for corporates. Spreads on bank lending increased sharply in both countries following the financial crisis, and while they have fallen a little since, they remain well above their pre-crisis levels. The story in corporate bond markets appears to be similar. If anything, sterling spreads are a little lower than dollar spreads suggesting that financial conditions are by no means tighter in the UK than they are in the US. Credit conditions do not seem to be able to account for any of the difference either. 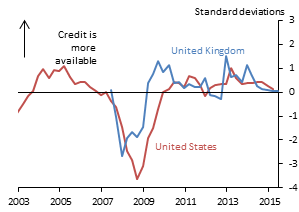 Surveys of the lenders in both the UK and US suggest that that availability of credit has eased by a similar amount in both countries (chart 2). And indicators of credit availability from companies also suggest that it has improved in the UK over the past three years. As such, UK corporates appear to have been able to access debt finance and some of the weakness in the UK is likely to reflect relatively weak corporate demand for debt. While credit conditions currently appear to be similar in the UK and US, it is possible that UK banks have taken longer to repair their balance sheets following the crisis, slowing the pickup in lending relative to the US. For example, while cumulative write offs for corporate debt since 2008 have now reached similar levels in both countries, US banks acted faster following the crisis to repair their balance sheets. This could be one reason why bank lending in the UK has been sluggish compared to the US, and would explain why following the crisis, bank lending relative to GDP turned positive more quickly in the US. This impact might have been amplified in the UK by the higher dependency of UK corporates on bank debt, relative to the US. In addition, banks in the UK have run down their outstanding loans to the commercial real estate (CRE) sector quite a lot over the past few years, while that process appears to have ended a while ago in the US, where exposures weren’t as big. 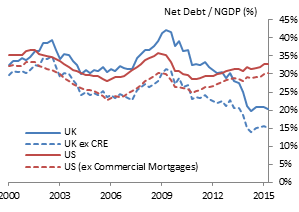 If we exclude bank lending to the CRE sector, that does account for some of the difference between net debt in the UK and US (chart 1), but it cannot account for a majority of the fall. Another factor that is unlikely to play a material role in the difference in corporate debt is changes in corporation tax rates. Over the past few years, corporation taxes have declined in the UK, which in a corporate finance framework would decrease demand for loans. Other things being equal, higher taxation on corporate earnings will increase the incentives to engage in activities, such as borrowing, that reduce the tax burden (through deductions on interest payments). A lower rate of corporation tax will therefore tend to reduce corporates’ demand for debt. But, at present, with interest rates low, the marginal impact of cuts in corporation tax alone is very small. Using one model suggests that the 9pp fall in corporation tax we’ve seen between 2008 and 2015 would have negligible effects on corporate debt. The more advanced M&A cycle in the US might have been associated with a high desire for debt. The US appears to have picked up earlier from the 2009 trough and more rapidly, although the UK has now begun to increase the volume of M&A deals. As some M&A deals are financed by raising debt, the difference in the M&A cycle could account for some of the difference in debt levels. US corporates might have taken on more debt in order to buy back shares. In the US, share buybacks have been a popular method of returning cash to shareholders, due to tax incentives which encourage the distribution of profits in this way. For example, it is relatively expensive to repatriate profits in the US, so US corporations are incentivised to borrow domestically and pay out shareholders through share buybacks: that has been associated with a general trend of negative net equity issuance, with a corresponding increase in net debt (chart 3). This trend continues on from the pre-crisis period. 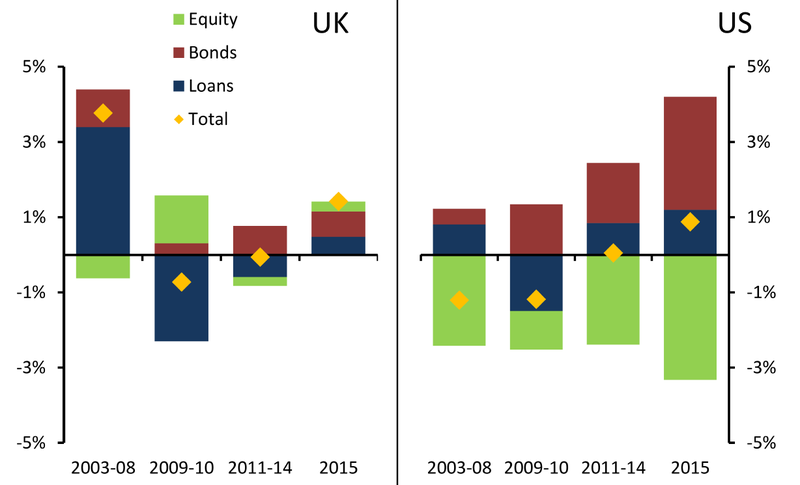 Despite the fairly marked differences between the UK and US in terms of the stock of net debt, total net external finance raised – that is, all borrowing and equity raising, less repayments, as a share of nominal GDP, has actually been rather similar. Consistent with both higher M&A, as well as more share buybacks, higher bond issuance in the US is in large part offset by reductions in equity. Chart 3 illustrates this: between 2011 and 2014, UK corporates paid off bank loans, while raising some finance in capital markets, with those two sources broadly netting out, and net equity finance close to zero. In 2015 so far, all three sources of external finance have risen a little. To sum up, there has been a divergence in the borrowing behaviour of corporates in the UK compared with the US. It appears that this is due to a combination of factors, particularly lower demand for debt from UK corporates. It does not appear to be due to tighter credit conditions in the UK. It should also be noted that while corporate financing via credit has varied in the two countries, when we look at total net external finance, we find that this has been broadly similar. Christian Schnittker works in the Bank’s Monetary Assessment and Strategy Division. Previous Post The cheque republic: money in a modern economy with no banks. Given the low rates of inflation, the current account balances of the business sectors of both the UK and US are very close to zero. The reason for any net borrowing is, therefore, for capital purposes and predominantly to finance the acquisition of equity. This includes both M&A activity and buy-backs. The reason that US companies borrow more (and deposit more) is for tax reasons. Firstly, US companies have amassed large offshore deposits in order to avoid taxes on the repatriation of profits. Much of these deposits have been applied to finance M&A activity and buy-backs. US corporation taxes are much higher than UK rates. Secondly, this difference in tax rates has encouraged more US than UK buy-backs because interest can be offset against profits. The UK does appear to have had a double-dip of deleveraging , with a significant second dip in 2013-2014 , compared to the single dip for the US. In the end , they look to be in similar positions. Looking at chart 1 it seems to me like once CRE and commercial mortgages are excluded the difference between US and UK corporates becomes even larger (gap goes from US at 32.5% UK at 20%= ~12.5% to US at 30% UK at 15%, gap =~15%). What am I missing? Also, Peter, if what you say about profits is true (and I think it’s a compelling story) why hasn’t there been divergence before this point? If the US tax environment has been more favourable for a while we would expect a divergence in net debt sooner than 2008. One must remember the previous large scale Sterling issuance in the scramble by UK employers to comply with FRS17. After the initial rush, this tailed off significantly.